Although London has the reputation of the city of grey skies, it isn't actually constantly grey. Sure there are grey days but equally there are blue skies, cloudy skies and magical sunsets. Throw in a river that rises and falls 8 metres with the tide, with history of battles and bridges, intrigue and murder and you start to fell the magic of London. Remember to visit the other skies around the globe. What a beautiful photo. It's very nice. I've had a flight with the impressive Millennium Wheel, it was fantastic. I like the colour of the sky, well photographed. That is a really lovely photo. Indeed, this is a lovely picture. Looks cold, there, though. I'll be back over there in April, and hopefully I'll get beautiful skies like this! Oh what a lovely shot. You know I'd never want to live in Seattle because of how gray and rainy it is there, but I've never once had the same thoughts about London. I think London would make it worth the gray and damp. Pretty! I've not seen a sunset like that in my visits to London. And Ivy: here's a secret -- Seattle skies can be a dazzling shade of blue even in the winter. We just keep it quiet. Lovely photo. It's a beautiful sky. You've convinced me. With that great shot of the London 'Eye' I believe you when you say London is a beautiful city. I call it the 'Centre of the Universe'. Please submit your blog or url on my blog. Since I discovered your blog, Mo, I've started believing what you say in this post: magical London! Love the colour! I don't know how Londoner's feel about the wheel. But to me its silhouette ads to the magic! 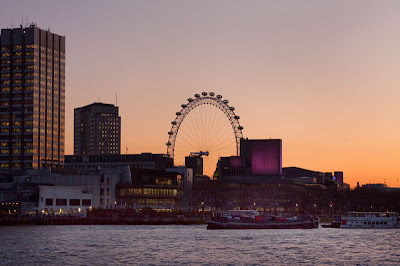 A lovely sky over London, with the Eye being a wonderful focal point. Great image!